A Silverbrow study is the ultimate way of organising all your personal or home business needs and can offer a furnished retreat in which you will appreciate spending time. All our studies are made to order and can be tailored to fit awkward room dimensions. 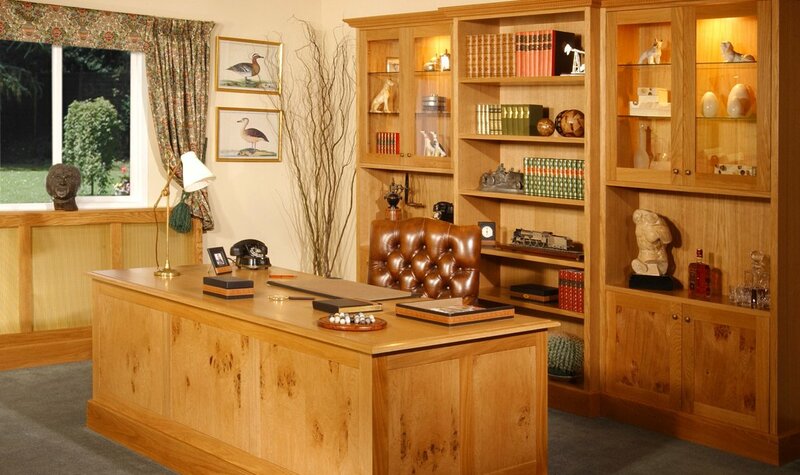 In addition, our selection of handmade furniture door materials, shapes and colours have been carefully selected to cover all design styles from the executive boardroom to the family snug. You can personalise your study by exploring the following points with your Silverbrow designer in the comfort of your own home or at one of our stunning showrooms. What type of functional storage aids such as CD racks, concealed pullout printer/scanner cabinets and lockable filing drawers do you require? Which worktop material, colour and edging detail best suits you? Do you require any open bookcase storage cabinets? Would you like any of the cabinets or desktop areas to be illuminated by spot or under lights and if so what type? Have you anything to display in glass cabinets such as prized trophies, awards or photographs? There are many more design concepts to be explored. Your Silverbrow designer will be there to guide you through the whole process to ensure that you and your families needs are fulfilled.